NotaryBonding.com has served Delaware notaries for many years and across the country since 1940. We have provided the State of Delaware with quality discounted notary supplies, notary packages and notary errors & omissions 4 year insurance policies. Tradition of Trust & Integrity Empowering Delaware Notaries. We are your primary provider source for all your notarial and supply needs. Fax, mail, email, call or place your order online today. Are you covered? Acquiring Notary Errors & Omissions Insurance safeguards you as a notary public for just pennies a day! Make certain you're covered! Learn more on Notary E&O. $ 5,000 Notary Errors & Omissions 4 Year Policy. Our Delaware Notary Impression "Official" Seal Embossers have exceptional impression quality that leave a clear, raised and sharp impression every time. All impression seal embosser's measurements fully comply with state statutes. Our Delaware Rectangular "Official" Seal Stamps are made of high-quality materials and have outstanding impression quality. All stamp measurements fully comply with state statutes. Be of good character and reputation. Be a legal resident with a street address in Delaware or maintain an office or regular place of employment within the State of Delaware. Have a reasonable need for a notary commission. Never have been convicted of a felony or a crime involving dishonesty or moral turpitude. 2 years for a first time commission; 2 or 4 years for subsequent terms. Optional. Notary Service and Bonding Agency, Inc. strongly recommends that Delaware notaries insure themselves against claims of negligence. Required. Embosser or black-inked rubber stamp. Required elements - notary’s name and the words “My Commission expires on (date),” “Notary Public,” and “State of Delaware.” A notary must contact the Secretary of State within 10 days if his or her notary seal is stolen, lost, or used by another person. Notaries must also notify their local law enforcement. Shape/Dimensions - not specified by notary laws. None Required. It is strongly recommended by the Secretary of State and Notary Service and Bonding Agency, Inc. that Delaware notaries public record every notarial act in a notary journal. A $60 filing fee is required for new applications; a $60 fee is required for renewals for a 2 year term and $90 for a 4 year term. None Required. Electronic notaries are required to show that they have taken a course of instruction (whether in the classroom, through distance learning, or online) on how to perform electronic notarial acts in accordance with the standards and guidelines established by the Secretary of State. Permitted. 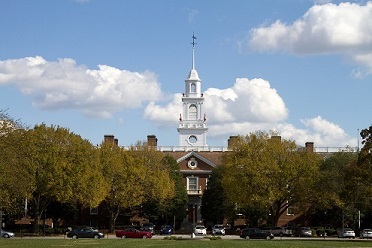 Non-residents must maintain a regular place of employment in the State of Delaware, and must meet the same qualifications as a Delaware resident. After the notary’s initial two-year term expires, the notary may apply within 30 days before the commission expires by completing a renewal application form. New or renewal notaries must complete and submit a notary profile and notary public application online. Continue here to complete a notary profile online. Continue here to complete the Delaware notary public application online. Payment is taken online. See the fee schedule for further details. Sign and take the Oath of Office and return a copy of your commission certificate to the Delaware Secretary of State's office. Once you have recorded your commission with the Recorder of Deeds in your county you can place your order for your new or renewal Delaware notary package. Once you receive your official stamp seal you will be authorized to begin your notarial duties in the State of Delaware.